Churches in St Petersburg Russia are not only stunning architectural masterpieces, but also a place of pray, as well as an important part of the attractions of the city. 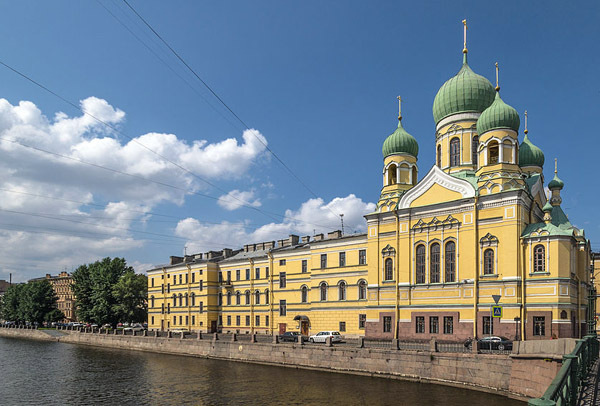 Built in the Russian Baroque and Neoclassical style during the so-called age of enlightenment, all churches in St Petersburg offers an intriguing and engaging insight into Russian culture and history - plus many of them are architecturally beautiful. Many of these impressive Russian churches were designed 200-300 years ago, following the taste of the Tsars and a few conservative aristocratic clans. They were built by the hands and creativity of great Russian and foreign architects, such as A. Voronikhin, O. Monferan, A. Parland and F.B. Rastrelli, who gave such a grandeur to the principal buildings of Russia’s new capital. However, you should also know that during the October Revolution in 1917 a lot of Orthodox churches in St Petersburg were blown up and destroyed, while other, luckier ones were turned into museums or used as cargo houses. Why? Because the Communist political party of that time was against any freedom of worship. So after the bloody Russian Revolution and until the end of 1980s, there were only a few churches left in Leningrad because of the soviet regime. But after the beginning of Perestroika, all the churches, those ruined or not, were returned to the St Petersburg Diocese and the process of their revival finally began. 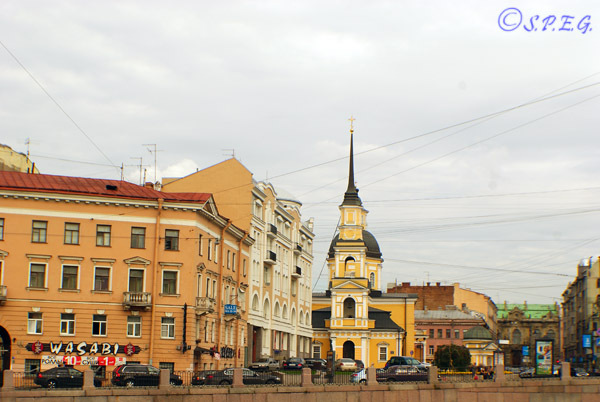 Today, thanks to a previous plan of reconstruction and renovation, which is still ongoing, Petersburg residents have many nice places of worship to go, while visitors like you have a huge and varied list of picturesque churches in St Petersburg to explore. To help you better plan your sightseeing in the city, we've made a list of what we think are the most interesting churches in St Petersburg Russia that no one should miss. With its 79.8 meters high and its richly coloured onion domes, the Savior on the Spilled Blood Church, is one of the most beautiful and picturesque churches in the city, as well as one of the most popular. This Moscow-style church, also called the Church of the Resurrection, got its awkward name because it was built on the spot where Alexander II was murdered in 1881. 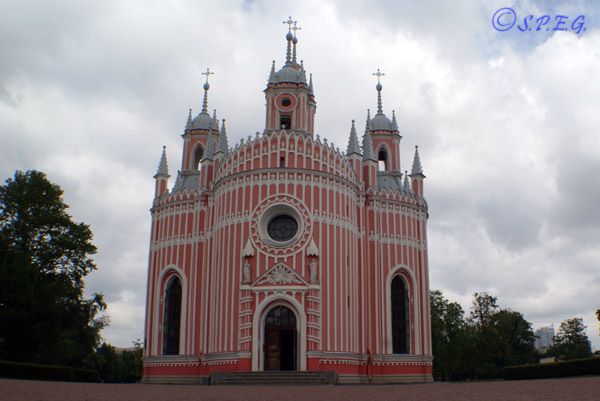 The Church of Vladimir Icon of the Mother of God is one of the oldest churches in the city, as well as the best example of a classical and baroque architecture style. Named after Vladimir the Equal-to-Apostles, it is known for its rich interior paintings and stained glass, but also for its Mother of God of Kazan icon, the image of the "Dormition of the Mother of God" which is a copy of the treasure of "Lavra". 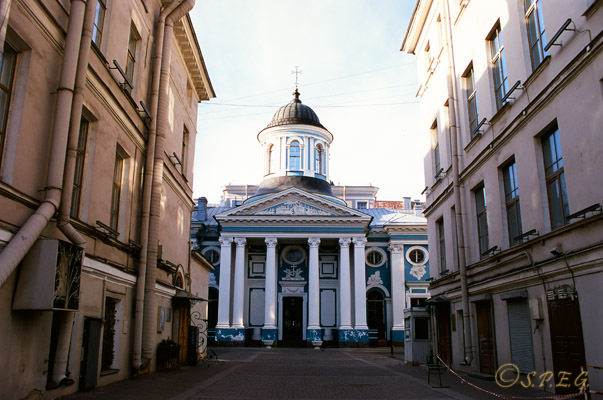 Built in 1903 for Estonian orthodox people living in Sankt Petersburg, the Church of St. Isidore is one of the last Orthodox Churches in St Petersburg to be erected before the Bolshevik Revolution. Even if you don't have time to go inside this charming Neo-Byzantine church, likely you will pass it at some point during a canal boat tour or while exploring the Kolomna District. 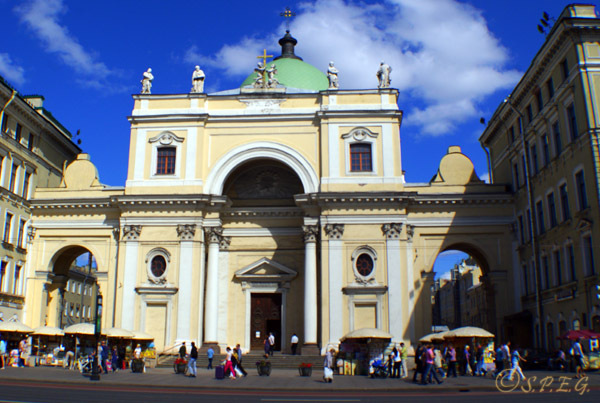 Founded in 1710 and standing on Nevsky Prospekt, the small Catholic Church of St. Catherine in St Petersburg is one of the oldest Catholic churches in Russia. Like many Catholic churches in St Petersburg, this building is a reflection of the past years of Russian history, the great, the stormy, the desperate, and the re-emergence of Roman Catholicism in Russia after decades of repression. The Chesme Church is one of the most impressive Orthodox Churches in St Petersburg, as well as a rare example of early Gothic revival influence in Russian architecture. Built during the reign of Peter the Great to celebrate two major naval victories over the Swedes, which both fell on the feast-day of St. Panteleimon, this small charming red-and-white Church of St. Panteleimon it is considered by locals one the oldest and nicest churches in St Petersburg. After being restored in 1990, it is now a museum and a place of worship open to the public. The Church of the Nativity of John the Baptist. 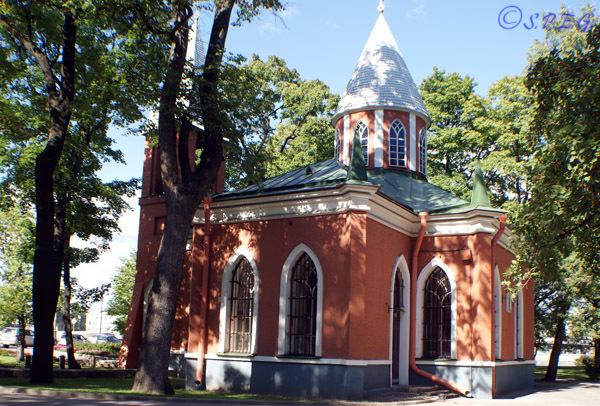 Not far from the Kamennoostrovskiy Palace, an old former Imperial palace on the South-Western promenade of Kamenny Island, you will find a beautiful park and the tiny unusual red-brick Church of the Nativity of John the Baptist. Created by the architects Yuri Velten and Giacomo Quarenghi, this is one of the few well preserved Gothic churches in the city which have not been destroyed during the War. Situated in the North-West of St Petersburg inside the picturesque student campus of the city's prestigious Polytechnical University, which is itself a masterpiece of Russian Neoclassicism, the Church of the Intercession of the Holy Virgin is one of the smallest churches in the Imperial city. Today this charming Orthodox church is fully functioning and open to the public. Standing on the Northern side of Nevsky Prospekt opposite Gostiny Dvor you can find the charming Armenian Church of St Catherine. 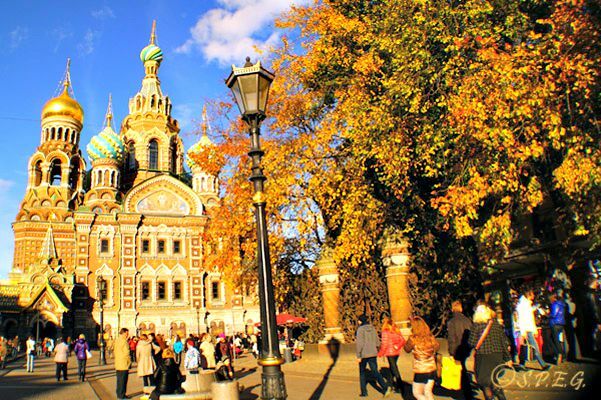 Although it is not one of the most popular churches in St Petersburg for visitors, its central location makes it an easy visit. 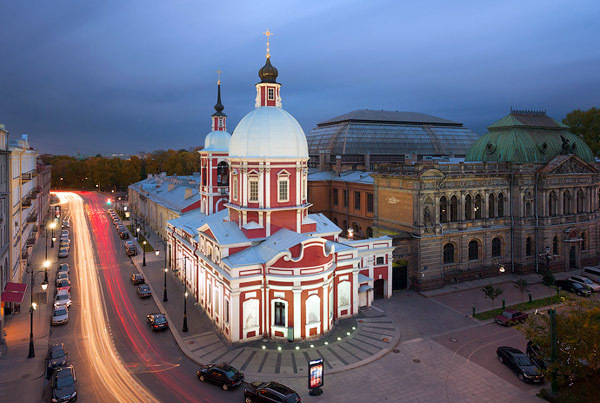 This orthodox church has a modest 180 metre-long arcade covered by a beautiful pitched glass roof and well decorated interiors. Erected on one of St. Petersburg's most picturesque corners, where ulitsa Belinskogo crosses the Fontanka River, the Church of SS. Simeon and Anna is one of the oldest churches in St Petersburg, and one of the finest examples of early Baroque architecture in the city. 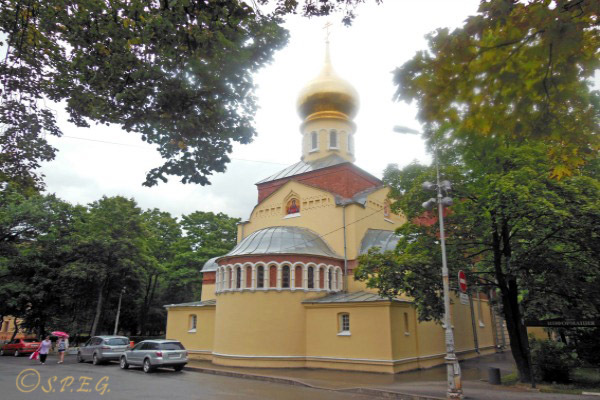 Recently restored, this charming Orthodox Church is now fully functioning and open to public. Would you like to visit one of the churches listed on this page?